When upgrading RAM to more than 28GB, the original 4GB RAM modules must be removed. The standard system is shipped without hard drives. 2. For the information of network card installation, please refer to chapter 6 in the Turbo NAS Hardware Manual. Support USB printer, pen drive, USB hub, and USB UPS etc. 5~95% non-condensing, wet bulb: 27˚C. 2. 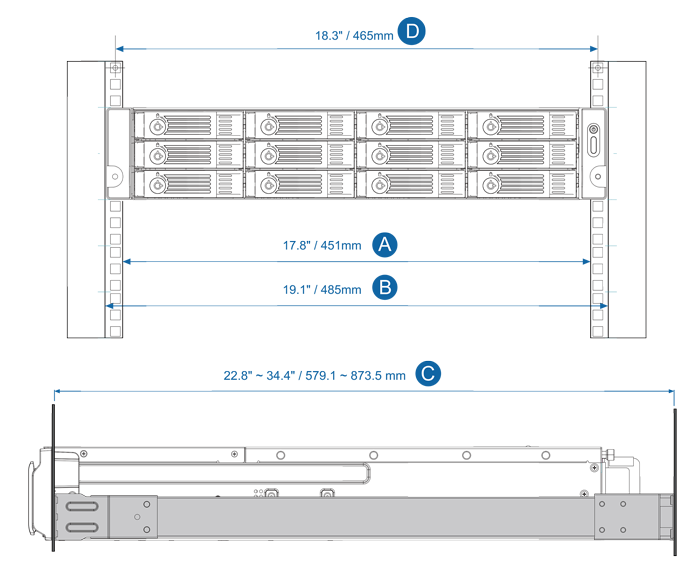 The optional rack kits for the TS-x80 rack mount models are only compatible with square-hole server racks. Designs and specifications are subject to change without notice. Bad Block Scan and Hard Drive S.M.A.R.T. Image, ARCserve Backup, EMC Retrospect, Symantec Backup Exec, LaCie SilverKeeper, etc. Support up to 8 Virtual Machine (32GB RAM is required) creating to run an operating system such as Windows, Linux, Unix. Supports ClamAV (free) and McAfee (optional purchase ) virus scanner. * This feature may vary according to different models. ** The data encryption functions may not available in accordance with the legislative restrictions of some countries. Design and specifications are subject to change without notice. Buying a NAS doesn't have to be complicated or stressful. This may only occur at times when looking to buy a diskless NAS as the risk element of receiving a faulty NAS or drives are accentuated. Nothing wrong in buying a diskless NAS and adding your own drives, the savings made may offset the inconvenience of receiving faulty NAS/Drives and having to go deal with returns, or does it? The argument against buying a diskless and self-populating with drives is quite compelling. We ensure all drives are compatible with the relevant manufacturer, model provide conformity with the relevant compatibility guidelines. All our disk drives are sourced from manufacturer recommended distributors – we don't buy aftermarket drives or purchase on open grey markets. Our comprehensive batch rotation ensures customer avoid batch issues and thus promote reliability and longevity. Our methodology for configuration, setting RAID and in-depth burn testing process for disk drives and NAS servers is unsurpassable and the small premium paid for this service is worth its weight in gold. We are authorized partners for all the NAS servers we stock. We only sell and support NAS solutions, as a specialist our knowledge is unsurpassable. Our expertise within the technical arena for NAS servers, provides the glue for preventing our customers from making an incorrect buying decision, as we share our knowledge. Our extensive and professional burn-testing service ensure the optimization and deployment of both NAS and Disk Drives is done to provide peace of mind and total integration. Ready to use out of the box, no if's or buts. Thinking of buying a NAS? QNAP, Synology, Thecus and Drobo – Over fourteen Comprehensive years relationship culminating in our expertise of understanding all the NAS products, and skillfully combining performance, reliability and features to ensure our NAS experts are always at hand to help our customers optimize their storage needs. At SimplyNAS we balance performance, reliability and compatibility to ensure customers get optimized NAS based disk solutions that perfectly match their Storage needs. All our pre-configured NAS systems are evenly balanced in the areas that really matter. NASBIT© is a Licensed trademark of SimplyNAS. The acronym stands for Network Attached Storage Burn in Testing. This term is used to describe the process of testing new Network Attached Storage (NAS) hardware and firmware for faults before putting it to use in a live environment. This is done by running 'Stress testing' software for a stipulated period of time often 24 to 48 hours, but longer if needed. When we receive an order for a NAS system pre-installed with disk drives it's prepared and configured with RAID followed by burn testing to ensure the entire system undergoes a thorough examination thus ensuring the server passes all tests to the highest standards set by us. Should the system hardware or any associated components fail at any point of the testing cycle the system is pulled and returned back as faulty our relevant vendor partner, the process seems simple but setting it up is far from easy. All Hard disk drives are pre-tested prior to integration; the smallest of faults be it tolerable within industry standards are classified by us as faults, the hard drive is rejected and eliminated from the process and again returned back to source as a D.O.A. (dead on arrival). We continue to select drives from different batches, so as to eliminate any bad batches that may have been produced during manufacturing. One integrated the drives are put through a vigorous routine that includes stress testing, including temperature tests and a host of read, writes to ensure the drive platters are stressed to the nth degree. First, when the new server is turned on, we boot off of the network, and proceed to run the memory test that takes its sweet time, almost 10-12 hours dependent on manufacturer and model. The appropriate RAID level is set and the system awaits completion of RAID synchronization. Once completed the NAS server undergoes numerous re-boots and a deletion of original RAID and a final re-build of RAID level again. Why is NAS Burn in Testing (NASBIT©) necessary? If within the designated time span the NAS servers are still running and with zero faults, it is considered suitable for rolling out to our customers. If there is a failure of any kind the systems is replaced with a new one, including hard drives and the process starts again, until the NAS servers passes with ZERO faults. You would normally expect that this level of testing would be completed by the hardware manufacturers and so these tests shouldn't show up any faults. In our experience of testing hundreds of machines we do find faults, and we do send systems back. The reason it is so important to perform this level of testing on NAS servers is that the uptime demands are so high. The slightest faults will cause outages and downtime. Once a NAS server is deployed, never again will you have the opportunity to take it offline and perform such detailed testing. Even if it were to crash, there is always a demand that it be put back online as quickly as possible, not left offline whilst thorough diagnostics are completed. Always remember this is hardware and failures can and will occur even after burn testing has been carried, that is a fact of life we cannot avoid, but we do try and eliminate some of the hassle factor with testing. Thank you for buying from us, we truly appreciate your custom. Copyright 2018 by SimplyNAS all rights reserved. Federal copyright law prohibits unauthorized reproduction by any means and imposes fines up to $25,000 for violation. If you have a question about what system you should buy, give us a call at 407-960-4690 and we'd be happy to discuss your needs.